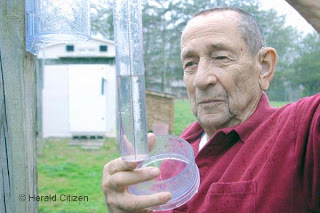 Our local newspaper, the Herald-Citizen, ran a story recently about CoCoRaHS. It featured one of our volunteers, Alfred (pictured above), who is doing a GREAT job. I'm thankful for the publicity. Today, they ran a story from a hydrologist who works for the NWS in Nashville. Hopefully, they'll post it online so that I can link to it. Spotter Training Classes are coming up. For our area, it will be this coming Saturday, March 29th at the Rescue Squad Building on Carlen Drive in Cookeville. Let the Putnam County Emergency Management Agency know you're coming by calling 931-528-7575. Excellent post at NashvilleWX.com today about the Red Flag Warning and what it means. I am cuckoo for CoCoRaHS! Dew...I enjoy it, too! It amazes me the difference in precipitation from place to place.